Sennheiser and Neumann continue to tease visitors to this year’s NAMM show as to what will be on display. More details have emerged since the companies’ inital announcement, with new wireless microphone and in-ear monitoring (IEM) equipment due from Sennheiser and Neumann’s first foray into studio headphones. There will also be a focus on AMBEO VR mic for immersive music recording and podcasting. Full details of some of the launches are still being withheld, with Sennheiser due to introduce what are described as "entry level wireless systems for bands and videographers". The US will also get its first trade show opportunity to see the SK 6212 mini-body pack transmitter, which was shown at IBC 2018. This is an addition to the 6000 digital wireless series and is almost half the size of equivalent current models in the range. Sennheiser will additionally expand its IE monitoring line with two new IEMs. The first studio headphones produced by Neumman Berlin will get a world debut and be shown alongside a subwoofer for the KH range of studio monitors. To support its product launches, Sennheiser is staging a series of performances to demonstrate microphones in action. These will take place on the Sennheiser/Neumann booth and include The Lovable Mutts, Ari and the Alibis and DJ Ill-esha. 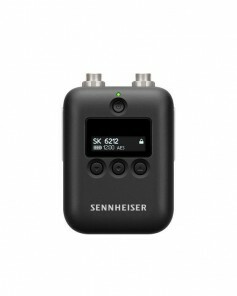 Sennheiser SK 6212 mini-transmitter bodypack. Click to enlarge. Immersive audio looks to make a splash at NAMM, as it has at other shows. Sennheiser's AMBEO VR microphone will be demonstrated for music production, video game sound and podcasting. Technology partner Dear Reality will give practical showings of its dearVR Spatial Connect mixing program. Sennheiser 3D audio software engineer Giordano Jacuzzi is to give a presentation about recording, mixing and reproducing binaural material on 25 January. Dynamic and Static Binaural Recording and Reproduction for Immersive Audio will take place between 4pm and 6m at the Hilton, Level 4, C7. The NAMM Show takes place from 24 to 27 January at the Anaheim Convention Centre, California.